The exact amounts of money and traffic you lose because of your website downtime depend on many factors. But judging by the stats coming from Forrester Research, Information Week, and other sources, the total losses will amount to ‘a lot’. Worst of all, having your WordPress blog crash will affect your credibility, especially if it happens often. For a blogger, any black mark on their reputation can literally bury a career, so it’s essential to get your website back up right away and prevent the problem from happening again. The most important thing to do before you start looking for restore a WordPress blog after a crash is to set up a monitoring system that will alert you when this happens. This way you will be constantly aware of website’s condition and will be able to act on a moment’s notice. You can easily set up an alert using uptime monitoring programs like DownNotifier or Pingometer. You see an error page with your host’s branding. The page times out or shows server error. You get alert of a non-PHP error that you don’t understand (hosts might have error codes of their own). You get a 500 or 404 error but the index.html, index.php, and home.html files are present in the website folder when you access it via FTP. You get an Error Establishing Database Connection message or a blank page. If that’s the case, contact your web hosting immediately. It’s common for bloggers to use shared servers, so problems like this might happen if you use an unreliable provider. If that’s the case and you aren’t satisfied with the support service you get, your first action after that should be to find a trustworthy budget hosting. There are many of providers like this and some of them even assist with moving your website. If the issue isn’t caused by the hosting, the first step to restore a WordPress blog after a crash is to access the backend using the address example.com/wp-admin. Try to login there and if you succeed, backup all your important files before disabling all plugins and resetting the theme to WP default. The vast majority of WordPress blog crashes are caused by plugins of themes. Usually, an updated version cannot integrate into your scheme, which brings the entire website down. If you get a PHP error alert, look at the file paths listed. The problem plugin should be the first one. Rename it using FTP and reload your website a few times. Once it goes back online, you’ll be able to disable the faulty plugin and find a replacement. Important Note:You’ll get a list of plugin errors the first time you visit the Plugins page after the website is back up. Make a screenshot immediately or copy it in any other way as there will be no other chance to see it. This is the list of deactivated plugins that you’ll need to get back up. If you’re lucky and the problem is caused by having one old plugin crashing the site after an update, the Update Everything route should fix all your troubles. Be sure to have a backup before you start updating. You might need to do it manually, depending on how much of your website crashed. If it’s not a hosting issue and the methods listed above don’t help, contact an expert as soon as possible. 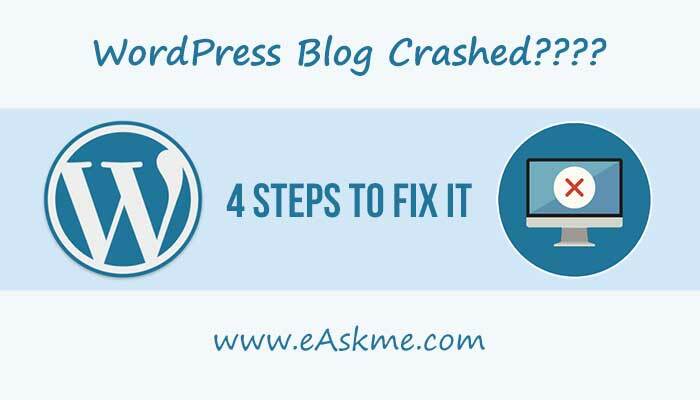 There are many ways to restore a WordPress blog after a crash, but they will require understanding of code and inner workings of the platform. Without those, your attempts at fixing might only make the situation worse.